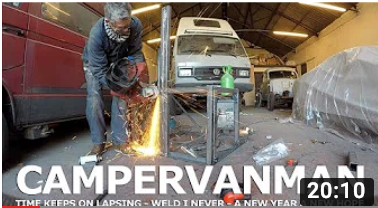 We had a lovely summer of freedom in the new (old) campervan this year (what a long time ago it seems!) We deliberately went at the end of the season (our daughter is 4 this year and starts school next year so it was our last chance) which was a bit of a risky strategy. It paid off overall but it was cooler, partly closed already, and a little sad with leaves already falling from the trees. The trip was actually 3 trips back-to-back, with a wedding near Rennes, followed by a week in the north with my soon too, and then a sprint down south after a mad day trip back across the channel to see Archie off back to his mum! Ah, the complexities of family life! It was the van’s first proper run since the drive back from Munich when I bought her. 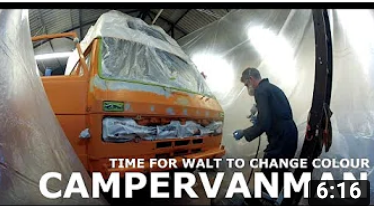 I had her serviced, and amongst other things added some sound deadening to the cab to try and make having a conversation manageable at speed. 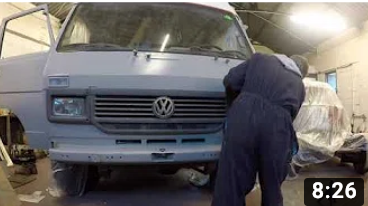 We knew we’d be doing a lot of journeying as we wanted to head for the sun on the last leg of the trip so this was essential given that the Volkswagen LT’s engine sits in the middle of the front seats! To keep the costs down we decided to do the Dover to Calais crossing. P&O ferries were both the cheapest and are the most luxurious provider this summer. It’s just annoying they don’t do the Newhaven to Dieppe run as this would be a godsend for us coming from Brighton. Hey ho! 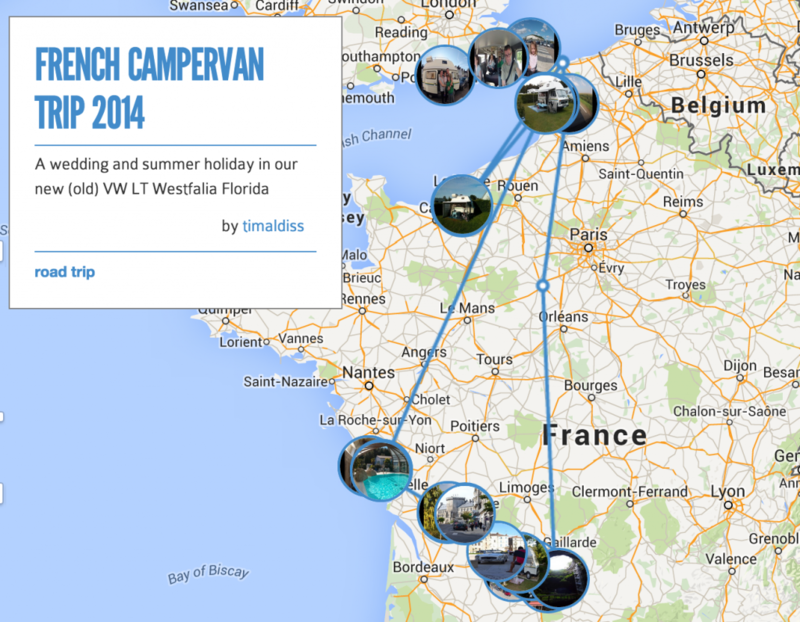 Our first stop was the pre-booked Yellow Villages campsite at Deauville on the Normandy coast. 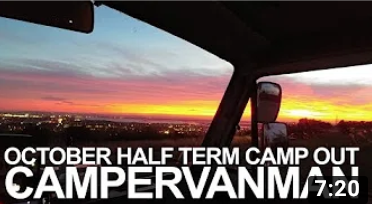 Chosen for convenience and the promise of kids clubs to give the Mrs and me some free time, it was an easy run from our Dover to Calais crossing. 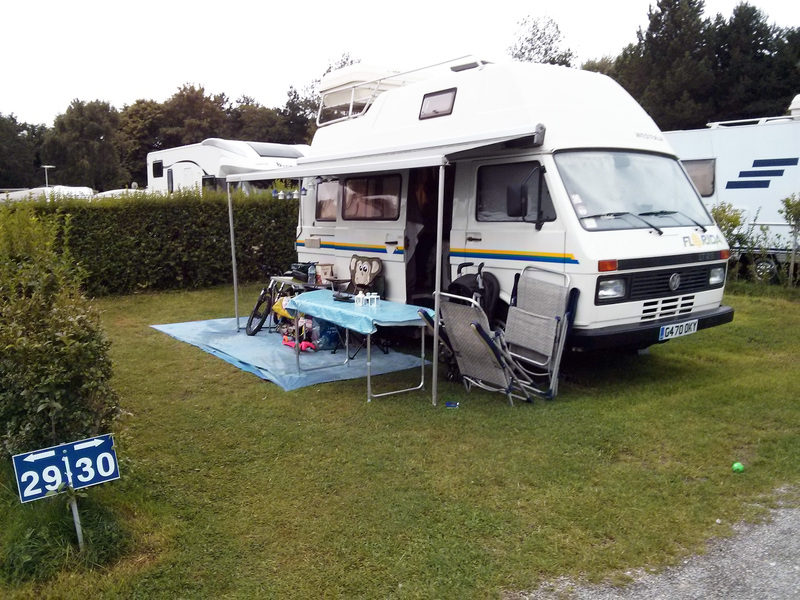 This was the first year that this campsite has been affiliated with Yelloh Villages which are a France-wide chain of sites of differing varieties (in the same kind of way the Best Western hotel chain is). It was tricky to find the site but we were pleased to see a typical French campsite layout with petanque terrain, sal de jeux, and bar & restaurant (no shop though). We pulled up on to our damp pitch and set up, plugging in mains and filling up with water for our 5 night stay. bar/restaurant – the friendly owners were always around and available, and the pression (though expensive) is of course always welcome! We don’t think we’ll return. We’d possibly recommend the site for a visit to Deauville but I imagine there’s an Aire de Reste nearer for a stopover to see the town. From Deauville we headed back north to Le Touquet ahead of our plunge south. This was in part for complicated reasons that I won’t bore you with, but also because we love Le Touquet. The town is basic and post-war but it’s the nicest on the north coast, has great shopping, and an excellent Cafe du Sport… but it’s the beach that is Le Touquet’s biggest pull. Miles and miles of the most amazing sandcastle-perfect sand and an incredible tide which means all sorts of fun with kiddies. There’s just one campsite here – Camping Le Stoneham (and a good aire de reste right on the front at the other end of town). The campsite is basic, with a games room, trampoline and obligatory petanques terrain, but it’s very convenient being right at the end of the free town shuttle bus. Catch market days in Le Touquet – Saturdays – it’s one of the best markets in the north. We love the town but there’s also something simple, decent and convenient about Camping Le Stoneham so we always recommend it and will always go back. 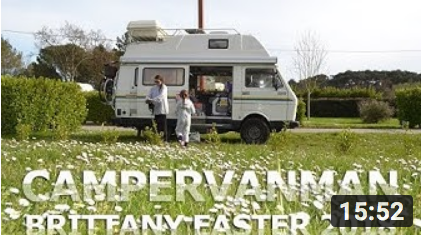 It’s the place to head for a long weekend in a campervan! 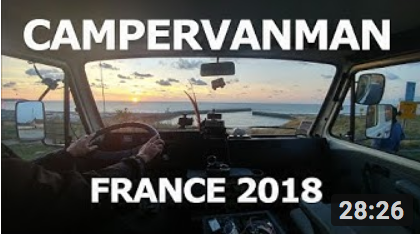 We plunged south, leaving Le Touquet early and taking the whole day to drive down to Île de Ré, near La Rochelle, just south of Brittany. 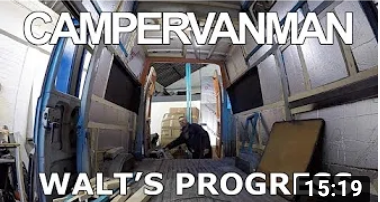 It was a great drive, the van (and it’s passengers) performing excellently, and our goal of finding the sun being realised with every kilometre under our wheels. It was our first visit to the Île de Ré. We loved crossing over the bridge as this gives you a real feeling of getting away from it all, and the island is very different to the rest of France. We’d been recommended the campsite by friends and it didn’t disappoint. It was full despite now being back in school term time. 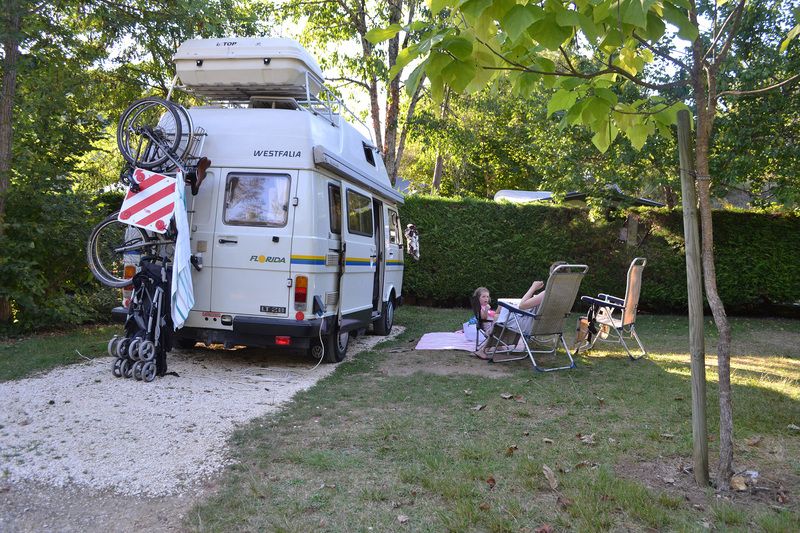 We pulled up under a pine tree and set out our full pitch ready for some sunning, swimming and cycling. The site was great with every facility you could need, and thankfully peaceful, but most importantly warm enough even in early September to walk around in T shirts and swimming costumes. not exactly the real France that we know and love… a bit too much like another country – maybe a dutch version of France?! I’m pretty sure we’ll be going back to La Grainetiere and we’ve recommended it to friends. 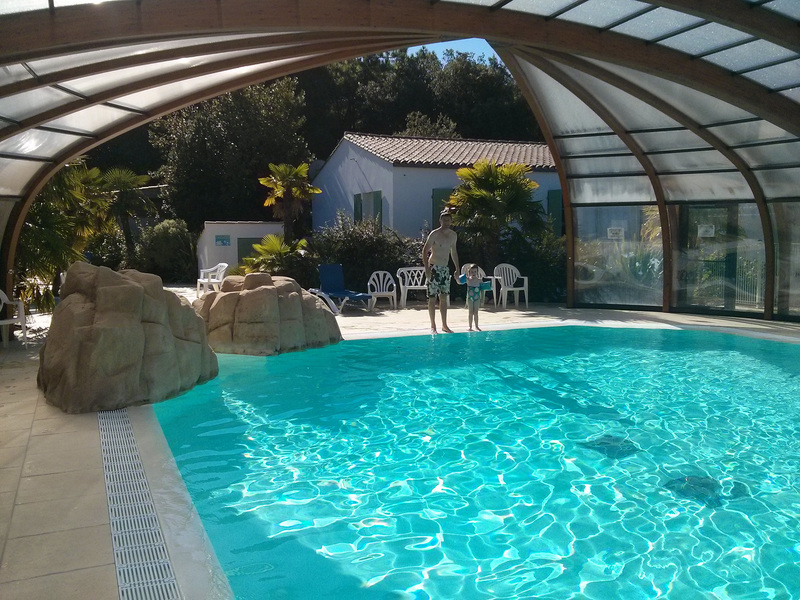 Staff were great, location and facilities great, and it was the perfect base to explore Île de Ré for the first time. We plunged south from Île de Ré but only after visiting the Phares des Baleines lighthouse at the westernmost tip of the island – a worthy diversion, especially on a hot day as you can climb the 247 steps to the cool breeze at the top for some spectacular views. 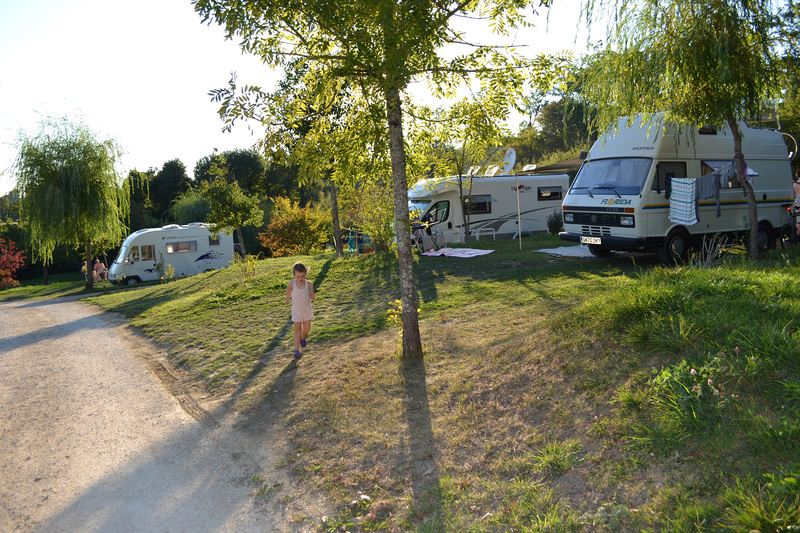 We stopped at 2 France Passion sites en route south east (covered in a separate blog post) before finding a remote but well signposted campsite near Les Eyzies in the Dordogne. This part of the world feels extra-remote out of season, and as we finally arrived at the end of a long lane we discovered we were one of just 3 guests on this pretty little campsite. Despite the (somewhat saddening) falling leaves the sun was lovely throughout the day, so the lovely outdoor pool was very welcome (although Monsieur had to fish himself out of the pool to come check us in, and plunged back in after he had done). A lovely tranquil spot if you don’t mind upping sticks lock-stock whenever you want to see anything in the area. We continued on our south east trajectory for our last leg before heading for home, leaving the Dordogne and stopping briefly at Rocamadour before settling on another well signposted campsite at Alvignac – Camping Padimadour. It was really hot, and a lovely pool area greeted us as we pulled up to check in. 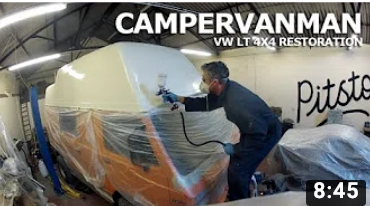 This site closes at the end of October so it still had a few weeks of business and did indeed have a fair few campervans (what’s happened to caravans these days?!) 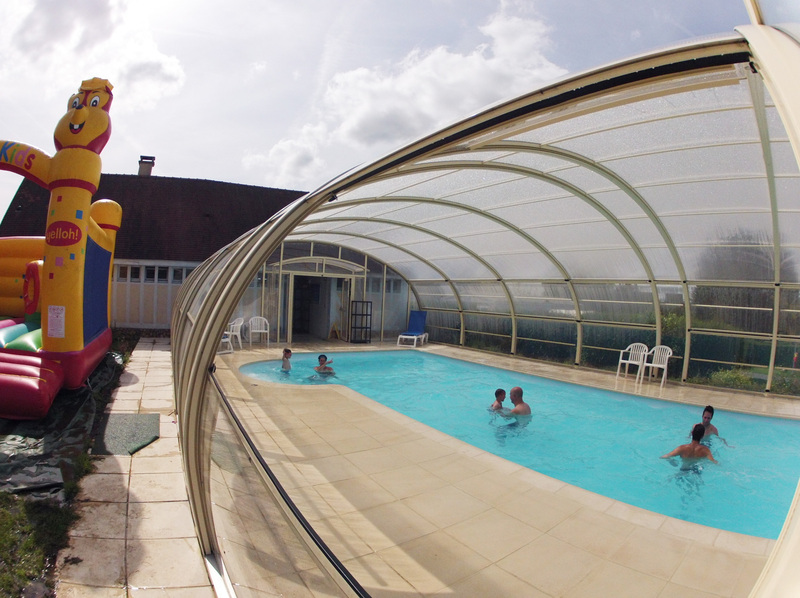 but it was still lovely and peaceful – we very often had the pool to ourselves. This was to be our base for 5 nights and it was the perfect end to a lovely trip. snack bar/restaurant only opened one night in the week! This represented a good distance south for us in our old van. It was only a 2 night stop to get home so we’d definitely aim to go back here (perhaps on a longer, madder dash to the south coast) and would definitely recommend it.